Theatre Royal Haymarket - LondonWhere Is Peter Rabbit? 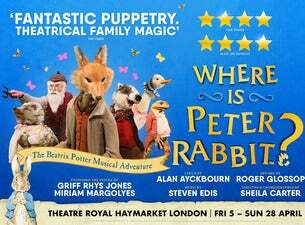 Hop onto your seats and immerse yourself in the magical world of Beatrix Potter! Where Is Peter Rabbit? will delight you as your favourite stories and most beloved characters are brought to life in a theatrical spectacular, with beautifully handcrafted puppets, enchanting original songs and a sprinkle of magic. Look out for the ferocious Mr McGregor, reach heady heights with Jemima Puddle-Duck, do the laundry with Mrs Tiggy-Winkle and of course, fall in love with the mischievous Peter Rabbit. Prick up your ears to catch the wonderful voiceovers from BAFTA Award-winning national treasure Miriam Margoyles (Harry Potter film series and Call the Midwife) and one of the UK’s most respected TV and stage personalities, the Olivier Award-winning Griff Rhys Jones. Handed down from generation to generation, these stories hold a special place in everyone's hearts. So whether a warm hug of fluffy nostalgia, or the perfect introduction to Beatrix Potter’s Tales, Where Is Peter Rabbit? is a truly charming production for the whole family to cherish and enjoy together. Based on the original Tales by Beatrix Potter. Suitable for ages 3 to 16 years old. The production is not suitable for children under 3 (in terms of content and to minimise disruption to audience and actors). However, if you decide to bring a younger child, you must purchase a ticket for them.